A watery grave: the Walbrook crania, a taphonomic explanation? In the early 1980s, Marsh and West concluded that ‘Celtic’ religious practices provided the motivation for deliberate selective deposition of cranial remains (heads) in the Walbrook. Since then, it has been accepted that ‘ritual’ deposition was behind the frequent discoveries of skulls. However, excavations carried out by MOLA between 1987 and 2007 revealed a Romano-British cemetery at the head of the Walbrook, and shed a somewhat different light. In addition to c.150 inhumations and cremation burials, huge quantities of disarticulated, redeposited bone were recovered from the stream channels, washed from graves on the banks. 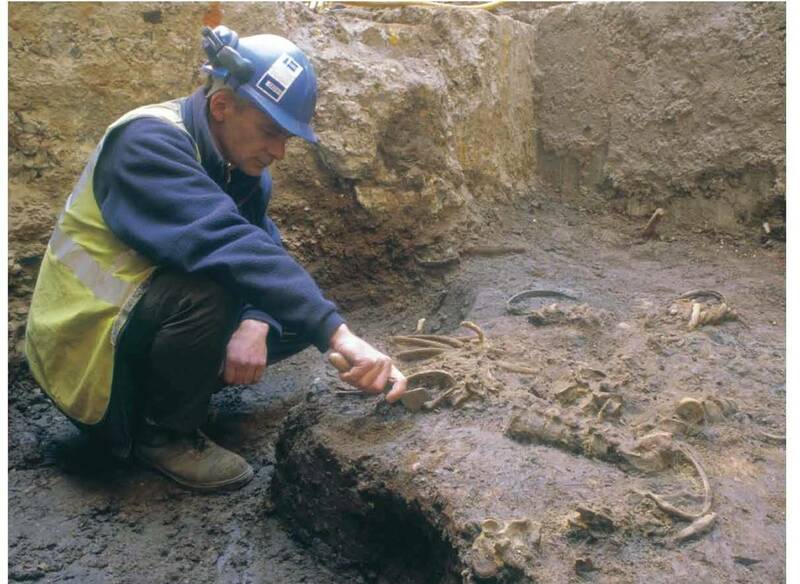 Partially articulated human remains demonstrate that disturbed, rotting corpses lay visible on the surface whilst the cemetery was in use in the Roman period. Either this location was considered of particular importance to those buried here, or they had little choice in where to bury their dead. Comparison with the forensic literature showed that the pattern of deposition was consistent with the way in which a body disperses in water and that crania would travel some considerable distance downstream. Whilst the head clearly played an important part in some Romano-British funerary rituals, flood events are the most convincing explanation for the deposition of most of the skulls which have been uncovered from the Walbrook.